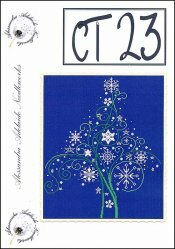 CT 23 (Christmas Tree) [C5732] - $15.28 : Yarn Tree, Your wholesale source for cross stitch supplies. Cross stitch pattern by Alessandra Adelaide Needleworks. Oh Christmas tree, how lovely you are in the night sky. The delicate design of the snowflakes & the brightness of the bright shining stars, decorate the branches of this Christmas tree. Stitch count is 182w x 221h.